After shutting out the Chicago Blackhawks on Monday night, Los Angeles Kings netminder Jonathan Quick collected his 41st career shutout and vaulted himself into first place for the most shutouts by a United States-born goalie. Quick made 32 saves at the United Center, including 16 saves in the third period, and handed Chicago yet another loss. The Blackhawks have lost three straight. The 30-year-old from Connecticut has put up four shutouts this season and boasts a 35-17-4 record with a 2.14 goals against average and a .921 save percentage. Quick reached the 41 shutout mark in just 463 career games. 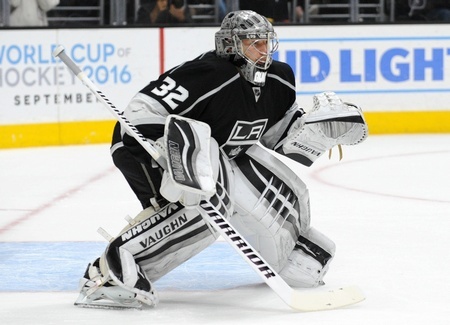 He has a lifetime record of 247-156-50 with a 2.26 career goals against average and a .916 career save percentage. In the 2011-2012 season, he put up 10 shutouts in 69 starts. In reaching the historical marker, Quick passes Frank Brimsek and John Vanbiesbrouck. Brimsek, also known as Mr. Zero, recorded 40 career shutouts playing his classic stand-up style. He posted 10 shutouts in 43 games in the 1938-1939 season, including six shutouts in his first seven NHL games. He spent his first nine seasons with the Boston Bruins and won the Vezina Trophy twice. He finished his career with the Chicago Black Hawks. Vanbiesbrouck was inducted in the U.S. Hockey Hall of Fame in 2007 and collected 40 career shutouts in 882 career games with the New York Rangers, Florida Panthers, Philadelphia Flyers, New York Islanders, and New Jersey Devils. The Beezer put up six shutouts in the 1998-1999 NHL season in Philly and managed to play a confrontational style despite his small stature. Among active NHL goalies, Quick ranks second behind Ryan Miller in games played. Miller has 36 career shutouts and could theoretically eclipse the mark as well, but most would argue his best hockey is behind him. Ottawa Senators netminder Craig Anderson has 33 career shutouts, including four so far this season, while Jimmy Howard and Cory Schneider have 21 shutouts apiece.